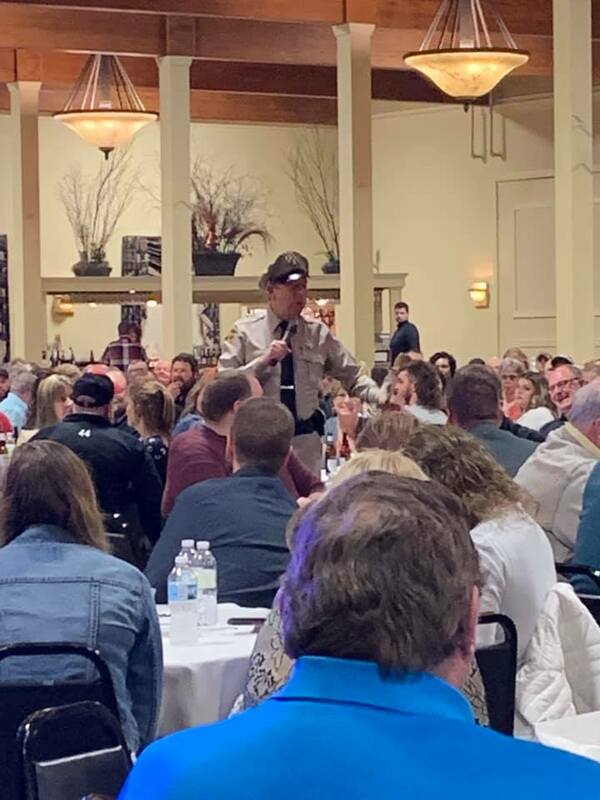 THE CHEESEBURGERS HAD an absolute blast at Saturday's Adams County Sheriff's Department Special Response Team fundraiser. The two comedians were incredible and a lot of people stuck around to rock the night away with us. It's always a good sign when you get done and have to collapse with a beverage and catch your breath. The Ambiance is one of Quincy's bigger venues and it was packed, probably more than 800 people from what we could tell. David Browning killed it as the "Mayberry Deputy." His character is based on Barney Fife from the Andy Griffith Show and he was spot on. He showed up when we were setting up and he couldn't have been nicer and easy to work with. At one point he says, "Ya'll know the song 'Hello Mary Lou?'" He sings it as "Hello Thelma Lou" and we sort of practiced it. "It's in G." Right. Got it. Near the end of his performance I grabbed my guitar and we pulled it off and it tremendous, and the entire place went nuts. Geesh. What fun! 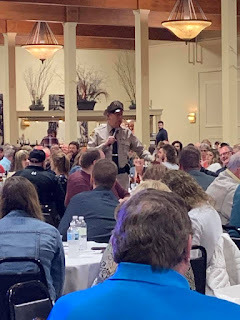 I loved his positive message and down-home humor, and his appreciation for law enforcement. The headliner was Mike Armstrong, well-known as the Ex-Cop from the Bob & Tom radio show. Again, a really nice guy, easy to work with and genuinely funny. Tim was a Street Crimes officer for the Louisville Police Department in Kentucky and some of the stories he told us before the show were epic. Again, I appreciated the fact that he kept it clean. I think the reason we laugh so hard is because there are kernels of truth in every joke and story he tells. They decided to have a band this year to keep people around, and it worked. They got all fired up and wouldn't let us stop, and those are the best gigs. We have more fun shows lined up this summer, but it will be hard to top this one!